Casual Wedding Outfits for Men. Wedding invitation bring a lot of confusion as in what to wear and how to pull together a cool outfit. Especially if it is a daytime or evening wedding you will be more confused as what dress will look appropriate or not. What you must keep in mind is that you should wear according to the event and not draw the attention away from the groom. Received a wedding invite? And don’t know what to wear, well don’t worry we have got the right outfits for you. When you want to attend any wedding and look glamorous yet casual then you can always rely on these two essentials: bow ties and braces. The great thing about these two accessories is that they add a semi formal touch to the entire getup and both of these things are hassle free and easy to carry. You can wear them on any colored button down shirt with complimenting pants and shoes. 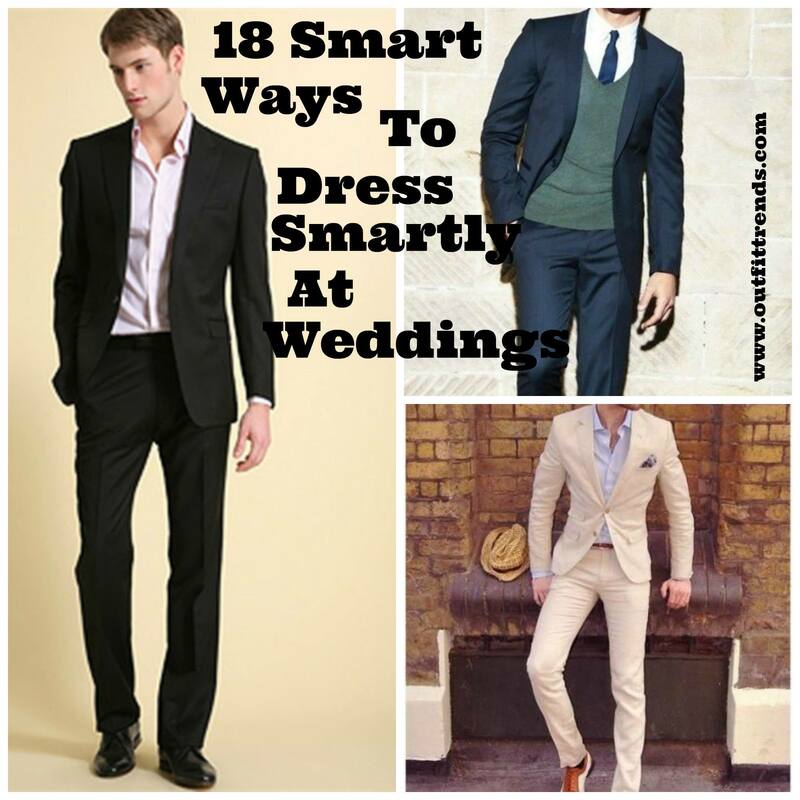 Want to easiest way out to look smart and stylish? Well the best way is to wear an informal or casual coat with contrasting colored pants. A little add on which are must are a pair of leather shoes or loafers. That’s it you are done with the ideal casual wear. Some days you might not want to dress way too much, well there is an easy way out to this as well. Simply pull on a tee shirt and wear it a long a casual coat and pants. An accessory which you should opt for is a belt. This attire is easy to manage and can be carried to a wedding as well as any other small event. Summers are a great time to experiment with light colors and you can do that in summer weddings as well. You ca wear plain shirts with complimenting pants or trousers, to add on more to the outfit wear the contrasting colors printed coat. This will give you the cool look that you’ve been wanting to achieve. Don’t forget to add on some really nice loafers. Fall weddings are usually everyone’s favorite as it holds a great deal to dress up and look fabulous. You can wear dark tones and carry them easily no matter what the time is. Even heavy textured clothing and suits look perfect and is a great look to opt for. Boys usually find it hard to carry the entire suited booted look. No issues, we have got an easy yet classy look for them as well! The idea is to simply wear denim pants with a blazer. This is a smart and casual way to dress up and can be worn to weddings without looking way too informal. Vintage looks are forever, you can always carry them and look classical. In order to attain the perfect look, go for a printed shirt with a waistcoat. In addition, add a flower brooch, this one accessory can make a lot of difference. Make sure you don’t forget to wear a wrist watch, and that’s it you are ready. Another smart and different way to dress up at weddings is to wear a well patterned suit which is well tailored. The great thing about this look is that it gives a hint of vintage style as well, which everyone loves! You can also add a complimenting colored tie to the whole look to add more charm. Not everyone is comfortable with the idea of wearing colors such as greens, rust or ochre colors. However if you are confident enough to wear these colors, then opt to wear suits of such colors to weddings. These colors add a rigged yet grace to your persona. You don’t always need bows and ties to add onto your dress to look all elegant and sophisticated, instead sometimes for a change opt to wear a suit with no tie or bow. This will look casual and not a stressful dress to carry. Spring weddings bring a lot of colorful choices, you can simply opt for a blue suit a long with printed shirt and a contrasting colored tie. This looks ideal in spring weddings as this attire will even reflect a lot of colors and positive vibes and keep you up in the happy mood. Not all might agree but adding some funky look to your wedding attire can be very attractive and unique style statement. For this all you simply need is a textured suit and combine it with a printed shirt. Simple yet different look! Usually all men carry the typical complimenting colored ties with the suits that they are wearing, well instead of this you can wear the same color tie as the color of the shirt, which in this case is white. This little difference of color make the whole appearance look totally different. Winter wedding require adequate amount of clothing and style at the same time. In order to achieve smart look, you can wear your favorite suit and combine it with a complimenting sweater to be worn on the shirt. This attire is easy to carry and gives a elegant touch to the persona. What Shoes to Wear to a Wedding? Here are our top shoe pics to wear for weddings this year, you should select one that goes best with your outfit style and color. I would like to carry out marriages, but haven’t found the concept/theme that fits for me. You can help find the right idea?